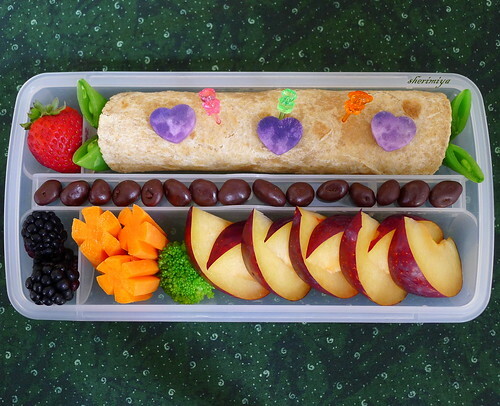 Hummus Rollup Bento, a photo by sherimiya ♥ on Flickr. What's that? Didn't we just have rollups? Um, yes. I wish I had taken a cross-section photo of this one to show you the goodies inside. I smeared a whole wheat tortilla with homemade hummus (I made mine pretty thick so it would act as a sticky spread rather than a runny dip), added shredded baby spinach, caramelized onions, roasted red pepper strips and rolled the baby up. I stuck a few cute picks to hold it in place, but as it turns out, this sushi box accomodates the rollup perfectly. How's that for multipurposing? I tucked a few steamed peapods on the sides and topped with Okinawan sweet potato heart shapes. There's a strawberry, blackberries, carrots, broccoli, and sliced plum. These plums are nowhere near as sweet as the pluots of last month, but they'll have to do. And if you have been looking at my bentos for the past few years you'll know I never put these in: chocolate covered raisins! I couldn't resist. They fit so perfectly in the chopstick slot. What do you think? Lol! I love it! I kept wondering what those little beans were :) That's cool that the raisins fit so well in there. Gorgeous! 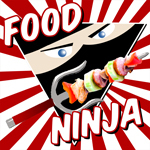 Creative and super cool bento! Rollup contents sound healthy and delish and I like how you've sparked the exterior with darling hearts and sweet colorful picks. Here for my daily dose of healthy charm...in smiles now! Mm!! My kid loves hummus, this she would love. But minus the other fancy stuff. lol. I love your sushi boxes, they're so cool. Sadly, those chocolate raisins would get confiscated at the kiddo's school. This is one of the prettiest rollups ever! I just discovered the whole bento thing quite recently. So these might be some stupid questions! But is the brocilli raw? Also how do you keep the apple from going like brown-ish, when I chop up my apple it doesn't stay fresh till lunch!